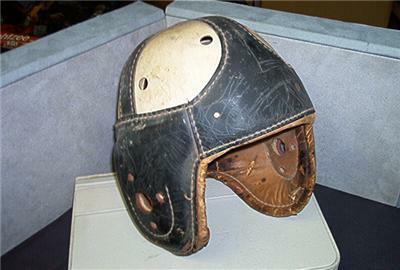 That site identifies the Goldsmith model 67 as a government-issue helmet used during WWII. Was it used for football? I think so. Was it also used in army tanks? Probably. Was it used by the Carlisle Indians? Probably not. Was it used by an army unit assigned later to Carlisle Barracks? Possibly. What is it worth? Something, surely, but I don’t have a clue to how much. I’d like to hear from some sports equipment specialists to learn more. This entry was posted on July 9, 2008 at 2:26 pm and is filed under Carlisle Indian School, Football. You can follow any responses to this entry through the RSS 2.0 feed. You can leave a response, or trackback from your own site.